Visit: www.photobucket.com and open an account, its free and easy to do. Place your desired photo's onto your pc and save them somewhere such as My Photo's or wherever. On your photobucket account you will see on the right hand side 3 x option boxes named BROUSE.. this is also where you will find underneath them a button marked + add more, click on that to open more BROUSE boxes. Now click on the First BROUSE box... this will open up a link to your own PC and LOOK IN.. gives you the options to find where you have stored your saved Photo's on your PC. Once you have found them.. left click ONCE on the photo you want, so it is highlighted and Press the OPEN button.. this will attach the link to that photo along side the BROUSE button on your photo bucket. Then Press the next Brouse button and select another picture and follow the directions above untill you have selected all the pics you want to upload onto yoor photobucket Photo album. Once you have done this click on UPLOAD. After a short time you will recieve a message tellinbg you all the pics have successfully uploaded. Look at the photo you want to use in your photobucket account you will see it has 4 x options below it.. you need for this forum to use the 3rd one down marked HTML... left click on the HTML code once.. a little yellow box will highlight stating SAVED... go to your hencam post and right click and press PAST.. the link to your pic will appear... once you press ADD YOUR COMMENTS.. your photo should appear like Magic in your post. I always re-size it to website friendly size before posting (its an option above the picture). •	BEFORE clicking on that – go to the box below which says: “Reduce to” followed by some numbers inside a box. Select the little gray arrow. •	Then click on “320 x 240 (medium)” This will make the photo a good size for the forum. •	NOW click on the “Choose Files” box. This will take you to your computer’s photo collection. •	Double click on the photo you want (from your computer photo file.) This will tell Photobucket which pictures you want to store there. It will not place them in the forum (or anywhere but Photobucket) until you want to do that. •	If you want to upload more than one photo, hold down your CTRL key as you click on the photos that you want to upload. •	Once you have your pictures selected, press ‘Open’ (or it might say ‘Upload’) and wait. •	Write whatever else you want to and then press ‘Enter’ or its equivalent! Lovely pictures they are too Cake! hmmm I did all that and i am not sure it worked. how do i check that the photos uploaded properly? Only way to check is to go to the thread you posted it on and see if its there. You did remember to check the Html button at the bottom of the comment box didn't you? It'll make him feel useful Suzy! Just drop out phrases like "you have selected HTML haven't you" and use words like upload, and browse, then he'll think you do know and just needed a little bit of help! Neil could this be made a sticky so its always available for new folk to see ? Stand back for USA wanting a definition of treacle, though I'm sure any type would do. Molasses. What do I win? Treacle - I was a kiddie and we were having weekend breakfast. Mum passed Dad's kipper but it slipped off the plate and into the sugar basin. Everyone was very calm about it. Dad slowly spread a slice of thick bread and butter with treacle (Goden Syrup, molasses...) and gently slapped it onto her face like they do in the flicks with a custard pie!! Magic...I love moments like that. We were at a posh Chinese restaurant with our mates and their brats. Matthew (then 14) flicked a bit of cream from his gateau that landed on the tip of Eric's nose and dissolved cackling - as did the rest of us (including Eric). Matthew bent his head to take a spoonful of cake...and Eric gently pushed his face down into the cake. Cake would like to make it clear that this is a different cake and not her. Any mention to cake in the above is purely coincidental to cake and cake is intact and has not had anything pushed face down into her! ooh err missus! The lady doth protest too much! Well, lets hope that, in this instance, she is being accurate - as we ARE discussing the face of a 14 year old boy. Uh oh. There was some HTML code that 'blanked out' the remainder of the "How To," Cake. I've changed to text mode and now its readable. Sorry about that! Yes - terribly clever you are! :D Excellent photos too! the object tag is disabled as it's easily abused to embed nasties into web pages so the forum bins them automatically. Was that English or Sanskrit? I see Neil has been going round the threads with a duster and a tin of polish. I'm sure we'll all benefit from his housekeeping. What on earth miss muddle is an account pic ? do you mean an Avatar Like CC's car or wazza's mouse ? I think see means when you click on soones acount and it comes up with a picture! so how do u do it???????? You just find the pic on t'internet that you want and copy the URL (the website address ;)) and paste it into the box. Right click on a picture (on a web page) and pick "Copy Shortcut", then paste it in the spot where it says Account Picture or Icon in your "Personal Information"
i di d it but the pic is too big its supposed to be horses!!! hmmm is it working yet? Paste the URL in here and I can re-size it for you if you want. You can use this for your icon Lucy. heehee. Thats a good one, Jonny! Now its the right size..silly Jonny! Wooo Hooo you got it figured out, jenhen..lovely girls you have there! Thanks Lynn, they are rather special. Lovely girls! Well done for cracking the pic thing too! What beautiful girls Jenhen! Thank you for sharing the picture with us. Now that you've cracked how to do it you'll be able to post some more!!! Lovely girls Jenhen, well done putting up the pic. Aw thanks you lot, that is so kind of you and I feel part of your family already. 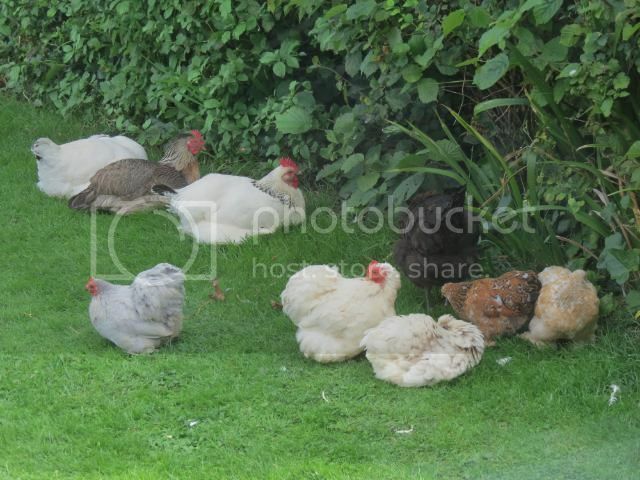 I took some individual piccies of the bantams the other day, so I shall try and post them for you to see. Well if photobucket would stop messing about I could show you all my new girls. We bought two beautiful ladies a few days ago; one Goldie (Poppy) and one bluebell (Bella). They have settled in well, after a bit of handbagging from the resident ladies. Yesterday was their first day exploring the garden and it was all very peaceful! How many have you got now Jenhen? Glad they've settled in so well!